Taxi map is a web service providing a fast, easy to use means for minicab companies to add taxi fare estimates and online cab booking to their websites. I am the lead developer for the project and I’d like to welcome you to our blog. I hope that over the coming months this blog will turn into a detailed insight in to the innovation behind Taximap and, as a bonus, documents its benefits and features. Some time ago a bunch of us started to play with the Google Maps API. It seemed pretty cool and we started to integrate it with websites we were building. At first simply as a means of providing a map on a customer’s contact page, but over time its endless flexibility and functionality captured the imagination of one or two people here at the office. More as a proof of concept than anything else, we began to build a site that could use Google Maps to estimate the price of a cab journey based on a price per mile – the idea borne from the constant question posed to our local cab companies as to the cost of a journey. In speaking to a number of taxi cab operators we determined that the main means of providing estimate prices for these firms was a chart making a rough correlation from A to B, though the taxi driver would often use the cab’s odometer at the end of the journey calculate the price. So we started on this project…. 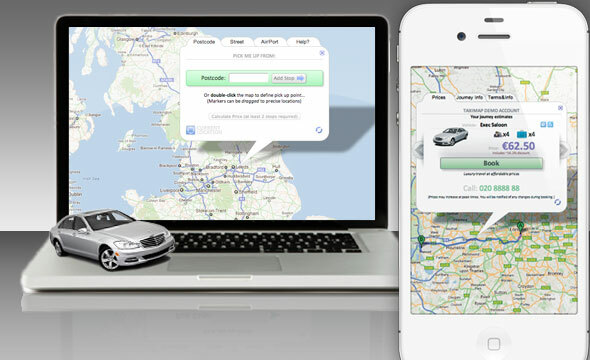 So far we have a highly accurate geocoding implementation that allows users to enter a UK postcode, a UK address, or select a major UK airport as one of up to 20 steps in a journey; we have built a back end that allows taxi companies to log in and enter pricing, and provided a booking page that submits the Google Map info back to the cab company. And we’ve even tested it on the Apple iPhone: A handy bonus if you’re rolling out of a club late at night and need to beat the taxi queue! Even with all this out of the way, there seems to be a never ending list of tasks outstanding as we all come up with ways to improve the system. So, we have come to the stage where we want to take the site live before we go any further…. to bring it beyond ‘proof of concept’ stage. To do this we need both cab companies and users. Here, dear reader, is where you come in. We’d invite you to have a look at the site as it is and leave us some feedback via the contact form or post a comment here? We hope to keep new functions and features up to date here in this blog so stay tuned.